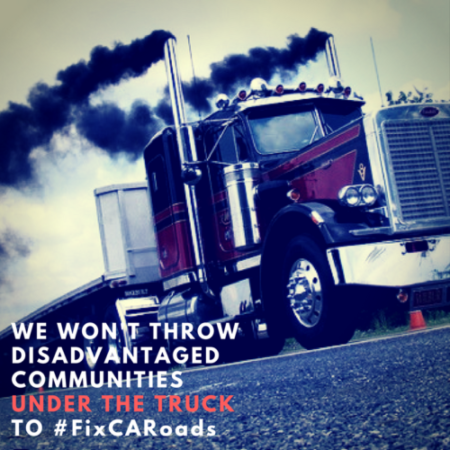 The Coalition for Clean Air urges you to join us in asking our legislators to stand up to the trucking industry by taking out a dirty air pollution clause from a major infrastructure bill called SB 1. The package has many positive elements, but now includes a poison pill in the form of a last-minute back-room deal with the trucking industry that yanks away important tools communities need to clean up deadly air pollution from vehicles at freight hubs. In particular, the language would impair air quality agencies like the California Air Resources Board and local air districts like the South Coast Air Quality Management District from cleaning up old trucks. Once again, a special interest is asking communities near ports, railyards, warehouses, and truck corridors to subsidize it through diminished health. We need our legislators to stand up against the “Assault our Lungs” language in SB 1 pushed by the trucking industry. The Governor and legislative leaders are trying to jam this package through quickly. We need you to call your legislators to oppose this provision immediately so we can salvage a good transportation package. We can win this, but we need to assert our voices loudly and quickly. While a transportation deal is important, it cannot come at the expense of clean air in our communities. We are surprised that our elected leaders would even consider a deal with the trucking industry that restricts the authority of air agencies to take the steps necessary to protect our health. Please have the courage to stand up to the freight industry and stand up for our children, neighbors, and families. We ask you to reject the inclusion of the “Assault our Lungs” language the trucking industry wants. This entry was posted in Clean Air, Climate Equity, Port & Freight. Bookmark the permalink.